But without a Brexit deal, the UK will become a "third country". 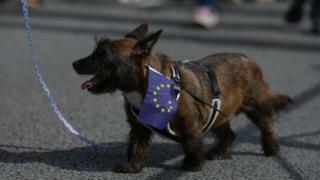 EU chief negotiator Michel Barnier has previously said "the ability... of dogs and cats to cross the Channel" will be affected if the UK leaves the EU without a deal - a scenario both sides say they are keen to avoid. According to the government's advice for pet-owners, the scale of checks required in a no-deal scenario will depend on which category the UK falls into. The government said it was pressing to become a "listed" third country when the UK leaves the EU in March 2019, which it says would avoid "burdensome" changes to requirements. But if it becomes an "unlisted" third country, pet-owners wanting to travel with their animals to EU countries would need to discuss this with a certified "Official Veterinarian" at least four months in advance. They would need to prove their pets were free of rabies - which could involve a vaccination followed by at least a 30-day wait before a subsequent blood test, which itself is then followed by a three-month waiting period before travel. The government says it believes reaching a deal with the EU is the most likely outcome but that it is its "duty as a responsible government" to prepare for the failure to reach one.